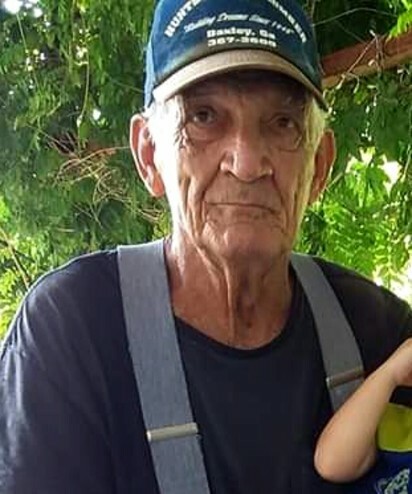 Mark Leon King, Jr., age 75, of Baxley passed away Saturday, November 24, 2018 at his residence. Mr. King was born December 10, 1942 in Appling County to the late Mark Leon King, Sr. and the late Emma Lou Barnes King. He was a member of the Pentecostal Church in Hazlehurst. Mr. King worked for many years with the Sheet Metal Union and was retired from Baxley Housing Authority. He loved his family and spending time outdoors, especially riding his tractor. In addition to his parents, Mr. King was preceded in death by his wife and mother of his children, Mary O’Neal Campbell King; and wife, Mary King; one brother and five sisters. Survivors include his daughter, Kelly Wood of Baxley; sons, Mark Leon (Shonna) King, III, Joseph Ashley King and James Andrew King all of Baxley; sisters, Rhoda Roberson, Emma Lee Stone, Eleanor Strickland and Faye Griffin all of Baxley; brother, Tommy (Sharon) King of Baxley. Twelve grandchildren and six great grandchildren also survive. Funeral services will be held Wednesday, November 28, 2018 at 2:00 p.m. at the Chapel of Swain Funeral Home with Rev. Gary Conger and Rev. Rick Brown officiating. Active Pallbearers will be Mark Leon King IV, Joshua Caleb King, Dustyn King, Matthew King, Scott Brewer and Zachary Stone. Visitation will be Tuesday evening 6:00 until 8:00 p.m. at Swain Funeral Home.